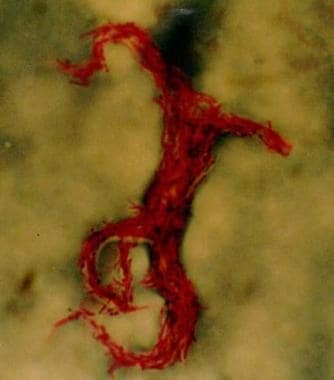 Acid-fast bacillus smear showing characteristic cording in Mycobacterium tuberculosis. Miliary TB may occur in an individual organ (very rare, < 5%), in several organs, or throughout the entire body (>90%), including the brain. The infection is characterized by a large amount of TB bacilli, although it may easily be missed and is fatal if left untreated. Up to 25% of patients with miliary TB may have meningeal involvement. In addition, miliary TB may mimic many diseases. In some case series, up to 50% of cases are undiagnosed antemortem. Therefore, a high index of clinical suspicion is important to obtain an early diagnosis and to ensure improved clinical outcomes. Early empirical treatment for possible but not yet definitive miliary TB increases the likelihood of survival and should never be withheld while test results are pending. On autopsy, multiple TB lesions are detected throughout the body in organs such as the lungs, liver, spleen, brain, and others. Following exposure and inhalation of TB bacilli in the lung, a primary pulmonary complex is established, followed by development of pulmonary lymphangitis and hilar lymphadenopathy. Mycobacteremia and hematogenous seeding occur after the primary infection. After initial inhalation of TB bacilli, miliary tuberculosis may occur as primary TB or may develop years after the initial infection. The disseminated nodules consist of central caseating necrosis and peripheral epithelioid and fibrous tissue. Radiographically, they are not calcified (as opposed to the initial Ghon focus, which is often visible on chest radiographs as a small calcified nodule). The incidence of miliary TB may be higher in African Americans in the United States because of socioeconomic risk factors and may be more common in men than in women because of socioeconomic and medical risk factors. No genetic predisposition has been identified. Miliary disease is more difficult to detect in patients who are very young or very old. Children younger than 5 years who acquire miliary TB are more likely to develop life-threatening miliary and/or meningeal TB. The disease usually follows primary infection, with no or only a short latency period. Adults older than 65 years have a higher risk of miliary TB. Clinically, it may be subacute or may masquerade as a malignancy. If undiagnosed, the disease is detected at autopsy. A decrease in sodium levels may correlate with disease severity, and the syndrome of inappropriate secretion of antidiuretic hormone (SIADH) or hypoadrenalism may complicate tuberculosis (TB). In approximately 30% of cases, alkaline phosphatase levels are elevated. Elevated levels of transaminases suggest liver involvement or, if treatment has been initiated, drug toxicity. Leukopenia/leukocytosis may be present in miliary tuberculosis. Leukemoid reactions may occur; patients may have anemia; and thrombocytopenia or, rarely, thrombocytosis may be present. The erythrocyte sedimentation rate is elevated in approximately 50% of patients. Cultures, as available, may include those of the sputum, blood, urine, or cerebral spinal fluid. Sensitivity testing is essential for all positive isolates, and consider investigation for multidrug-resistant TB (MDR-TB) in all cases. Negative sputum smear results (even 3 negatives) do not exclude the possibility of TB. For mycobacterial blood cultures, findings are positive in approximately 5% of patients who do not have HIV infection. Findings are positive in many patients who have HIV infection. One study yielded an 85% positivity rate. Leukocytes: Approximately 65% of patients have WBC counts with 100-500 mononuclear cells/μL. CSF lactic acid levels are mildly elevated. Measure the prothrombin time/activated partial thromboplastin time (PT/aPTT) prior to biopsy. The tuberculin skin test with purified protein derivative (PPD) often yields negative results in patients with miliary TB. This may be explained by the large number of TB antigens throughout the body. Negative tuberculosis skin testing results do not exclude the possibility of TB. Specificity for smear-negative and culture-negative specimens is lower than 100% (false-negative results). False-positive TB cultures are of concern, and the rate is estimated to be approximately 5%. This may be due to laboratory contamination. Polymerase chain reaction testing of the blood may yield positive results in most cases of HIV-related disseminated TB; the yield is low in non-HIV miliary TB. Findings are typical in 50% of cases. A bright spotlight helps to reveal miliary nodules. Bilateral pleural effusions indicate dissemination versus localized and unilateral pleural TB. This may be a useful clinical clue. Nodules characteristic of miliary TB may be better visualized on lateral chest radiography (especially in the retrocardiac space). Chest CT scanning has higher sensitivity and specificity than chest radiography in displaying well-defined randomly distributed nodules. High-resolution CT scanning with 1-mm cuts may be even better. It is useful in the presence of suggestive and inconclusive chest radiography findings. Ultrasonography may reveal diffuse liver disease, hepatomegaly, splenomegaly, or para-aortic lymph nodes. Use this to assess for suspected TB lesions. Hydrocephalus or a cerebral mass lesion (tuberculoma) may increase the risk of herniation if lumbar puncture is performed. Abdominal CT scanning may reveal para-aortic lymph nodes, hepatosplenomegaly, or tuberculous abscess. Echocardiography is the most sensitive test for pericardial effusion. The culture yield for transbronchial biopsies is 90%. For abdominal involvement, laparoscopy is useful to obtain tissue and material for culture. Necrotizing granulomas are the hallmark of TB, and staining for acid-fast bacilli reveals rodlike structures in approximately 80% of specimens (see the image below). The disseminated nodules consist of central caseating necrosis and peripheral epithelioid and fibrous tissue. Radiographically, the nodules are not calcified. Failure to involve a TB specialist may lead to acquired resistant TB. Adequate attention to nutrition is important. Many patients with miliary TB are debilitated by the disease, and malnutrition can contribute to a weakened immune system. Once the patient receives several weeks of effective therapy, experiences significant clinical improvement, and has negative sputum acid-fast bacillus smears, restrictions are minimal. However, one must be certain that the patient truly is no longer contagious. The absence of sputum positivity does not guarantee others protection against exposure. Directly observed therapy is optimal for assuring compliance and preventing relapse. Paradoxical enlargement of the lymph nodes or intracerebral tuberculomas during adequate treatment may require steroids. Hydrocephalus may require neurosurgical decompression. Early empirical therapy for suspected miliary tuberculosis is prudent. A delay of even 1-8 days contributes to a high mortality rate. Steroids are warranted for hypotension due to presumed adrenal insufficiency after an adrenocorticotropic hormone (ACTH) stimulation test. For susceptible organisms, the treatment period is 6-9 months. For meningitis, it is 9-12 months. For miliary TB with meningeal involvement, daily medications for the entire length of therapy are recommended. For MDR-TB, use a minimum of 1 susceptible injectable and at least 3 additional susceptible drugs to prevent the development of additional resistance. Treat MDR-TB with the consultation of an expert in the care of TB. Intermittent-type therapies have not been established. If MDR-TB test results are pending, increasing the number of drugs is reasonable. For example, use 6 or 7 initial drugs, including an injectable. If the infected patient lives in a home with immunocompromised persons (eg, with HIV infection) or with children younger than 5 years, or if the patient lives in a communal residence type of facility (eg, homeless shelter, senior citizen facility, jail, prison), keep him or her hospitalized until sputum stain results are negative and significant clinical improvement is shown. Evaluate all close contacts who might have been infected prior to initiation of effective therapy for evidence of tuberculosis (TB). Contagiousness is low because miliary TB spreads hematogenously, not via the endobronchial system. Cavitary lesions are highly unlikely. Patients may start and continue treatment in an outpatient setting if no children or immunocompromised persons are in the home or if the patient is not in a communal residence facility. Each patient should be offered directly observed therapy in the clinic, home, or workplace. Miliary tuberculosis during pregnancy can be treated safely with RIE (ie, rifampin, INH, vitamin B-6 [25 mg/d] and ethambutol (EMB) [15 mg/kg/d]), but miliary TB in a newborn of a mother with TB is difficult to diagnose. Placenta examination by the pathologist is imperative. In a newborn, 3 gastric aspirates of the newborn are helpful, but tuberculin skin testing of the newborn during the first 6 months is rarely helpful because of the limited immune response of the newborn. Lumbar puncture is indicated if the newborn does not thrive. Bacille Calmette-Guérin vaccine clouds the interpretation of a positive tuberculin skin test result after age 6 months. The patient is usually removed from isolation when 3 consecutive sputum smear results are negative and clinical improvement is shown. The patient must not be confined with immunosuppressed patients prior to the establishment of negative sputum cultures. Place the patient in a negative pressure room or in adequate respiratory isolation. Patients who discontinue medication may be subject to public health laws. Patients may be remanded to custody and ordered to continue therapy if judged to be a public health hazard. When ordered compliance is not successful, the health department may obtain an order of detention. If left untreated, the mortality associated with miliary tuberculosis is assumed to be close to 100%. With early and appropriate treatment, however, mortality is reduced to less than 10%. The earlier the diagnosis, the better the likelihood of a positive outcome. Early treatment for suspected TB has been shown to improve outcome. Most deaths occur within the first 2 weeks of admission to the hospital. This may be related to delayed onset of treatment. Up to 50% of all cases of disseminated TB detected at autopsy were missed antemortem in reported case series. The relapse rate is 0-4% with adequate therapy and directly observed therapy, although results from studies vary. Most relapses occur during the first 24 months after completion of therapy. Educate the patient and contacts about the mode of transmission. For patient education information, see Bacterial and Viral Infections Center, as well as Tuberculosis. [Guideline] American Thoracic Society, US Centers for Disease Control and Prevention. Diagnostic Standards and Classification of Tuberculosis in Adults and Children. This official statement of the American Thoracic Society and the Centers for Disease Control and Prevention was adopted by the ATS Board of Directors, July 1999. This stat. Am J Respir Crit Care Med. 2000 Apr. 161(4 Pt 1):1376-95. [Medline]. Blumberg HM, Burman WJ, Chaisson RE, Daley CL, Etkind SC, Friedman LN, et al. American Thoracic Society/Centers for Disease Control and Prevention/Infectious Diseases Society of America: treatment of tuberculosis. Am J Respir Crit Care Med. 2003 Feb 15. 167(4):603-62. [Medline]. Mert A, Bilir M, Tabak F, Ozaras R, Ozturk R, Senturk H, et al. Miliary tuberculosis: clinical manifestations, diagnosis and outcome in 38 adults. Respirology. 2001 Sep. 6(3):217-24. [Medline]. Sharma SK, Mohan A, Sharma A, Mitra DK. Miliary tuberculosis: new insights into an old disease. Lancet Infect Dis. 2005 Jul. 5(7):415-30. [Medline]. Talavera W, Lessnau KD, Handwerger S. Extrapulmonary tuberculosis. Friedman LN, ed. Tuberculosis: Current Concepts and Treatment. CRC Press: Boca Raton, Fla; 1994. Regnier S, Ouagari Z, Perez ZL, Veziris N, Bricaire F, Caumes E. Cutaneous miliary resistant tuberculosis in a patient infected with human immunodeficiency virus: case report and literature review. Clin Exp Dermatol. 2009 Jul 29. [Medline]. Shafer RW, Kim DS, Weiss JP, Quale JM. Extrapulmonary tuberculosis in patients with human immunodeficiency virus infection. Medicine (Baltimore). 1991 Nov. 70(6):384-97. [Medline]. Alsoub H, Al Alousi FS. Miliary tuberculosis in Qatar: a review of 32 adult cases. Ann Saudi Med. 2001 Jan-Mar. 21(1-2):16-20. [Medline]. Kim JH, Langston AA, Gallis HA. Miliary tuberculosis: epidemiology, clinical manifestations, diagnosis, and outcome. Rev Infect Dis. 1990 Jul-Aug. 12(4):583-90. [Medline]. Hussain SF, Irfan M, Abbasi M, Anwer SS, Davidson S, Haqqee R, et al. Clinical characteristics of 110 miliary tuberculosis patients from a low HIV prevalence country. Int J Tuberc Lung Dis. 2004 Apr. 8(4):493-9. [Medline]. Maartens G, Willcox PA, Benatar SR. Miliary tuberculosis: rapid diagnosis, hematologic abnormalities, and outcome in 109 treated adults. Am J Med. 1990 Sep. 89(3):291-6. [Medline]. Bourbonnais JM, Sirithanakul K, Guzman JA. Fulminant miliary tuberculosis with adult respiratory distress syndrome undiagnosed until autopsy: a report of 2 cases and review of the literature. J Intensive Care Med. 2005 Nov-Dec. 20(6):354-9. [Medline]. Joint Tuberculosis Committee of the British Thoracic Society. Chemotherapy and management of tuberculosis in the United Kingdom: recommendations 1998. Thorax. 1998 Jul. 53(7):536-48. [Medline]. Munt PW. Miliary tuberculosis in the chemotherapy era: with a clinical review in 69 American adults. Medicine (Baltimore). 1972 Mar. 51(2):139-55. [Medline]. Slavin RE, Walsh TJ, Pollack AD. Late generalized tuberculosis: a clinical pathologic analysis and comparison of 100 cases in the preantibiotic and antibiotic eras. Medicine (Baltimore). 1980 Sep. 59(5):352-66. [Medline]. Biedrzycki OJ, Baithun SI. TB-related sudden death (TBRSD) due to myocarditis complicating miliary TB: a case report and review of the literature. Am J Forensic Med Pathol. 2006 Dec. 27(4):335-6. [Medline]. Lillebaek T, Thomsen VO. A patient with suspected sarcoidosis died from miliary tuberculosis. Scand J Infect Dis. 2000. 32(2):218-20. [Medline]. Myers JN. Miliary, central nervous system, and genitourinary tuberculosis. Dis Mon. 2007 Jan. 53(1):22-31. [Medline]. Stas P, D'Hoore A, Van Assche G, Geboes K, Steenkiste E, Penninckx F, et al. Miliary tuberculosis following infliximab therapy for Crohn disease: A case report and review of the literature. Acta Gastroenterol Belg. 2006 Apr-Jun. 69(2):217-20. [Medline]. Mu XD, Wang GF. Images in clinical medicine. Miliary tuberculosis. N Engl J Med. 2010 Sep 9. 363 (11):1059. [Medline]. Disclosure: Received salary from Pfizer for employment.